How to make filing a breeze! One file for each family member – eventually you might want to break these files down to individual Doctors, Dentists, etc. Remember though, Social Security cards & birth certificates should be in your fireproof safe and if they aren’t here is my recommendation from Staple’s….. Expand on this as necessary. You might have another house, you might travel frequently and need one for your frequent flier information. You also might have a boat in which you can add the insurance in your insurance file right away. You could also just have a “Boat” file too. Files are a fluid concept and will need tweaking from time to time as your life changes. Also, now a days we are able to download our bank statements online and therefore don’t need to file years of bank or investment statements anymore (yippee). I recommend downloading and saving anything that you can on your computer and you can use the same system above for your “digital” files as well. I hope this motivates some of you to get started on your filing. It isn’t my favorite task but it is definitely one that is important. I think having my filing done is a really good feeling. Does this motivate you to get started? Well, it should come as no surprise that my very first blog posting for Office Candy is about our Jamie Raquel totes. I absolutely LOVE these file totes! I just recommended them to a client for her daughter as she goes back to school so that she can keep her personal paperwork organized and in one place. I first bought these when my organizing business (LNMOrganizing.com) was getting started and I hadn’t gotten my file drawers in the new office yet. I quickly filled one and then bought a second one in green. Now that I have everything in the big drawers I use these totes for small projects where I need to reference multiple things at any given time. It’s also awesome to literally pick it up and take it wherever I go and people are always impressed with them and how great they are to use. 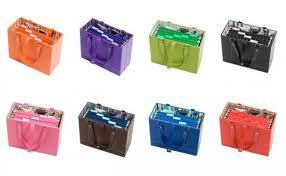 These totes come in red, lime green, chocolate brown, black, plum, royal blue and pink as you can see below. They cost $60 and they will last forever!